Hope to write an article describing my experience w/both of my MD recorders and the Trials and tribulations of the Uploading audio battles. I was blown away by the sound quality when I first got an MD recorder last year. I bought the Sony MZ-N10. It was the only one that I could find that had a mic input. Well, the new one I got is the Sony MZ-NH1. I boasts a 1 GB storage capacity and you can finally upload recorded audio via the USB cable. My only compaint: The cradle only charges the unit and doesn't serve as a cradle for the USB cable. Here is a link to the spec sheet from sony. 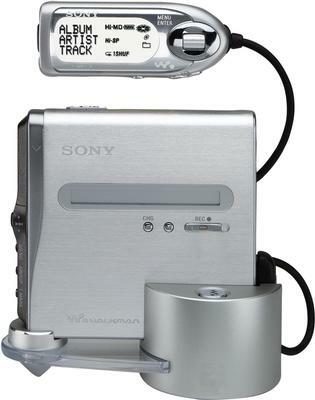 Here is a list of features from minidisc.org Features: Top of the line model from Sony's first line of Hi-MD recorders. Backlit, 3-line, Kanji-displaying (Japan only? ), jog-dial equipped remote (RM-MC40ELK - ¥8000). Charging stand. (USB connection done separately, through body). Auto Personal Disk Memory capacity: 18 discs of 500 tracks/9 discs of 2047 tracks. Bookmark function (up to 2047 tracks). Digital pitch control (allows playback speed change without pitch change). Records to Hi-MD (1GB) blanks and normal MD blanks reformatted to 300MB. Plays Hi-MD and original-MD disks. Provides PC uploading of audio recorded from microphone or line input. Functions as USB data drive (FAT format filesystem). Linear PCM and ATRAC3plus recording at 256 ("Hi-SP") and 64 ("Hi-LP") kbps. Operating power provided over USB bus when connected to a PC.